H.O.R.S.E. Poker is currently the most popular mixed poker game in the world. HORSE is a mixed poker game where you play multiple different variants of poker games during the course of a game. The game type changes at set intervals whether this be a certain number of hands, or in a tournament situation when the blind levels increase. It owes it’s popularity to the World Series of Poker which started to feature a $50,000 buy in HORSE Poker championship in 2006. This was by far the most expensive buy in for an event at the World Series and that combined with the perception that it was a chance to really prove yourself as a good poker player across many disciplines of poker made it a very prestigious event. Of course it has been popular in bricks and mortar (offline) casinos for many years before this where players often prefer to play a mix of poker games rather than a single game. What this does is reduces the edge that one particular player has (who might be a specialist in one of the games) and to be successful a player must play well across multiple variants of poker. It is commonly thought that games like HORSE and other mixed games are the best judge of a player’s true poker ability. So… How do you play HORSE Poker? In the mixed game of HORSE Poker you play 5 different variants of poker rotated in order. The rules for how the games are rotated will vary but will usually be based on a set number of hands (usually one round of the table) or tournament levels. Each letter stands for a different poker variation that is played in the order shown below. Once all five poker games have been played the game goes back to the start and the rotation starts again. Usually all the games in HORSE are played in fixed limit format and can be played for a wide variety of stakes. For more detail on limits and how this affects the betting rules please read our guide to Poker Stakes & Betting Limits. HORSE is enjoyed by an ever increasing number of poker players and to be successful it is important to get a good understanding of how to play each game. HORSE is also very popular with recreational players as it offers a variety in play. Quite a few online poker rooms offer H.O.R.S.E. Poker for their players. If you don’t know how to play the game then you need to make sure you read and understand the rules of each game before going starting to play. 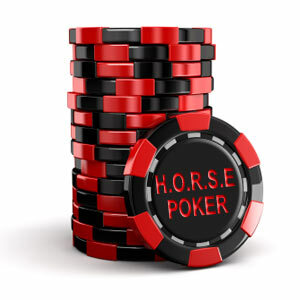 If you would like to try playing HORSE Poker but are fairly new to any of the 5 games involved then we recommend that you try playing in a low stakes HORSE Poker Tournament. These can be found online for just a few dollars buy in and will offer you an inexpensive way to get a feel for the game and just have some fun trying all the different games. HORSE Poker is a difficult game to play due to it being a mixed game. As a result it is not as popular as the individual games and you will have to play at one of the larger online poker sites to find a regular HORSE Poker game. If you are looking for an online poker site that offers HORSE poker then you should head over to our Play Poker section where we can recommend to you an online poker site that is trusted and also offers HORSE Poker games.